We work all week in the office and keep coming home every day feeling more stressed and tired than the previous. After a while, our back starts to hurt, and we feel pretty much run down day after day. Unfortunately, this is a common scenario among the majority of office workers. The usual workstyle takes its toll and, over time, we become more and more stressed. Furthermore, work stress can lead to many physical and personal problems, which makes it a dangerous issue that we shouldn’t ignore. Is there a way out? Can we rid ourselves of office-related stress? 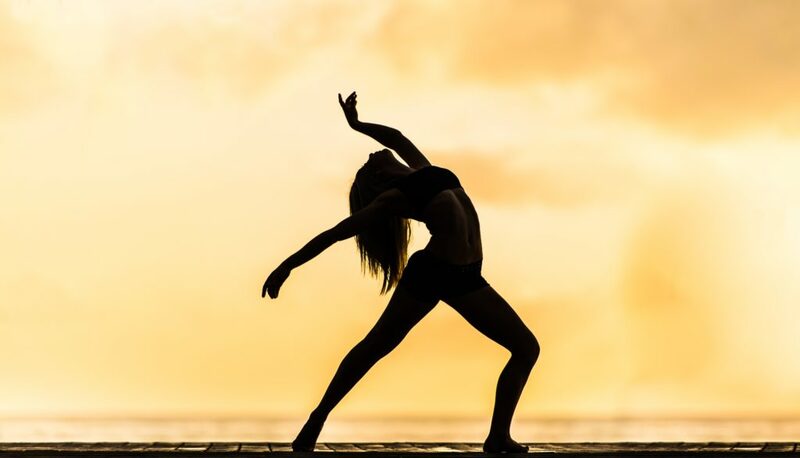 Stretching is a highly effective technique and a form of physical exercise in which we either stretch or flex a particular muscle to improve its elasticity. With regular stretching, we achieve increased muscle control, flexibility, as well as a range of different motions. Also, stretching decreases the risk of injury. How does that help alleviate work stress? Once we start stretching on a regular basis, we’ll be able to notice multiple improvements in our overall well-being. For instance, stretching extends tight muscles that pull parts of our bodies away from their intended position and thus helps ensure correct posture. Moreover, if we stretch our lower back muscles, as well as chest and shoulders, we will keep our spine in alignment, relieving any aches. In addition, stretching promotes blood circulation, which boosts our energy levels. Only a couple of minutes of stretching per day will make us feel energized and awake, even after a full eight-hour shift. Finally, regular stretching relieves creaky joints and stiff muscles, which enable us to move around more easily and with less pain. 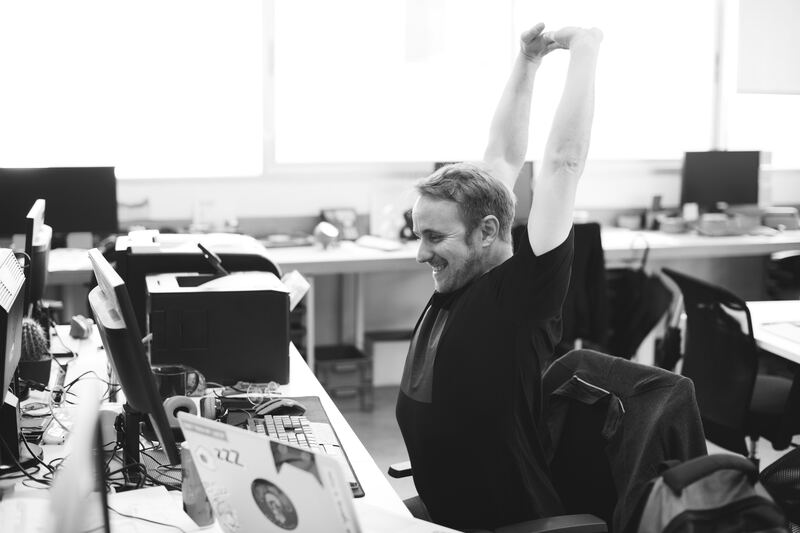 It might seem foolish to start stretching at work at first, but for those of us who spend most of our time sitting in the office, stretching is mandatory. Only a couple of minutes per day can make a huge difference. Not only will we feel more energized than before, but we’ll boost our productivity at the same time. Also, some of these stretching exercises are so simple and subtle that our colleagues won’t even notice us doing them. In order to stretch your neck, you only need a chair, and even that’s not necessary. Either sit up straight in your chair or stand up. Drop your left ear toward your left shoulder and you’ll feel a mild stretch on the right side of the neck. Breathe, let your right shoulder drop, place your left hand on your head, and start pulling down gently. Hold for 20 to 30 seconds, and repeat on the other side. If your neck is very sore, you can also try this: drop your head down to your chest as far as you can and slowly start turning your chin towards your right shoulder. Then, slowly turn toward the left one. Repeat both movements up to 10 times, but don’t make complete circles, as that could put pressure on your spine. When it comes to stretching your shoulders, you can also either stand or sit in your chair. Make sure that your neck and head are stable, and slowly start to roll your shoulders forward, up, and back, until you complete a full circle. The circle should be as large as possible, and you shouldn’t scrunch your shoulders toward the ears. Repeat 10 times in one direction and 10 in the opposite one. You can’t stretch your legs in your chair, but you only need a small space around your desk to do it. Stand up, push your chair out of the way so that you have enough space to do a lunge. Step forward with your right leg by bending your left leg in the knee and making a right angle. Slightly lean forward until you touch the floor with the bent knee and feel your leg stretching. Repeat with the other leg. Either stand up or sit in your chair, put your arms out to the side (as if you were surrendering), keep your spine straight, and start pushing your arms back until you feel your back and chest stretching. Hold for 20 to 30 seconds, rest, and repeat 10 times.